Is it really true, as has been previously argued on The Conversation, that supermarket “ugly food” campaigns don’t actually reduce food waste? That argument says that selling less-than-perfect produce at cheaper prices encourages consumers to continue undervaluing fresh food, leading them to waste even more of it. But we think this misses the point. The purpose of these campaigns is not to encourage people to waste less food in their houses, but to reduce the amount of fruit and vegetables wasted during production, or “pre-farmgate”. This is not to say that household food waste isn’t an issue. Australian households, on average, each reportedly throw out more than A$1,000 worth of food each year – the equivalent of A$2.5 billion just in New South Wales – and much of this can be avoided. Yet household bins are not the only place where waste is found. 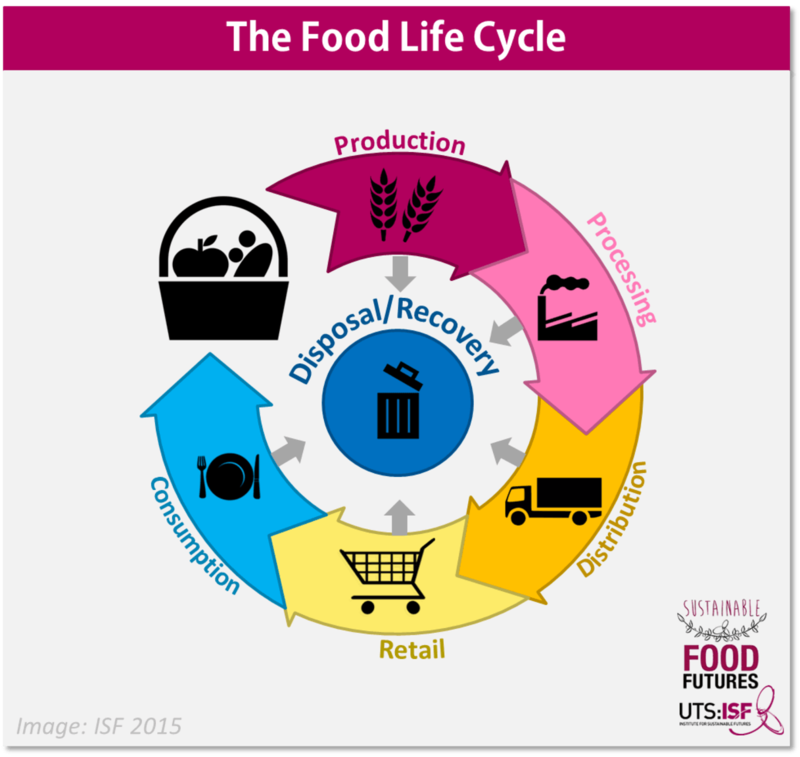 Food waste occurs across all stages of the food “life cycle” – from farm production (“pre-farmgate”) all the way to consumption in homes and restaurants (so-called “post-consumer” food waste). Many people assume that in affluent nations like Australia, most food waste happens at the post-consumer stage. But a look at the waste data at different points of the food life cycle reveals a more complex picture. Certainly, post-consumer waste is a much bigger concern in industrialised countries than in developing nations, which have to contend with pests, disease, poor harvesting techniques, inadequate transport and storage infrastructure, and contamination during processing. But this doesn’t mean that industrialised countries like Australia have totally eradicated pre-consumer food waste. The graph below, from a report by the United Nations Food and Agriculture Organization (FAO), shows that food is still wasted in the production stages, even in Europe, North America and Oceania, in volumes comparable to or greater than in developing countries. In fact, in developed countries, the amount wasted in production is often just as much, if not more, than that wasted in the consumption phase. 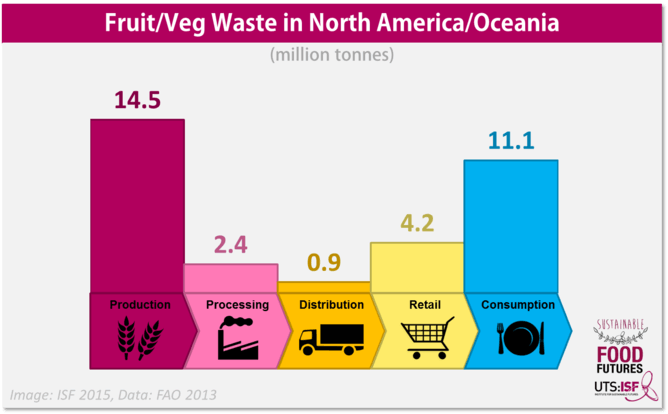 Global food waste quantitites, pre-and post-consumer. This is particularly true of certain types of food, such as fresh fruit and vegetables. While Australian data is not available on how much waste occurs at each stage of the life cycle for fresh fruit and vegetables, a report on the FAO’s evaluation methods estimates that North America and Oceania together waste 14.5 million tonnes of edible fruit and veg pre-farmgate every year, compared with 11.1 million tonnes wasted at the post-consumer stage. Food wasted at different stages of the cycle in America and Oceania. 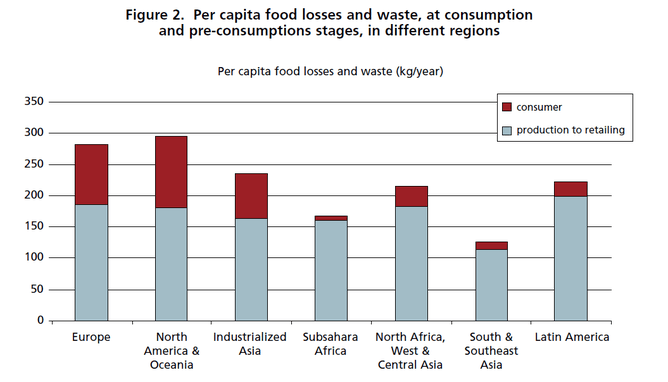 The causes of pre-farmgate food waste in developed countries are different to those in developing ones. A 2011 national assessment of food waste in Australia showed that one of the main causes is “failure to meet quality control measures”. Similarly, research in the UK estimates that up to 40% of produce grown on farms would fall foul of supermarket quality standards. Stories from Australian growers suggest that this is indeed an issue that can cost them money and lead to significant waste in crops such as citrus and mangoes. Some “imperfect” produce is sold by producers for lower-value uses such as pulps and juices. But without sufficient alternative markets for these “ugly” foods, much of the produce inevitably goes to waste. Supermarket “ugly food” campaigns therefore aim to influence consumer behaviour in order to create an alternative market for these foods, ensuring that perfectly nutritious fresh fruit and veg don’t end up wasted on the farm because of their appearance. These campaigns are growing on a global scale. In 2012, British supermarket Sainsbury’s relaxed its rules on the appearance of fresh produce after a drought resulted in smaller crops and varied-looking produce. Intermarche in France launched its “Inglourious” line of misshapen fruit and veg, which was a media hit and prompted many other stores to follow suit. In Australia, retailers Harris Farm and Woolworths, as well as wholesalers and home delivery services such as Spade and Barrow, have also taken up the “ugly food” campaign. While these campaigns will help to reduce pre-farmgate waste, the availability of “ugly” food could also create new norms, perhaps ultimately changing consumer expectations and allowing more diversity of produce in mainstream fruit and vegetable sales. Meanwhile, these campaigns also have broad public appeal and can create awareness about food waste in general, and may encourage householders not to throw out food simply because of appearance – offering a lifeline to avocadoes and bananas that have committed the crime of turning slightly brown. And yet no campaign can single-handedly solve the issue of pre- or post-consumer food waste. What is needed is a large, complex, multi-pronged effort tackling food waste all along the food life cycle. But “ugly” food campaigns are definitely a good step towards reducing pre-farmgate waste, making them an important piece in the puzzle of how we can all stop wasting so much perfectly edible food.